Once a year, on the 7th of December, Milan celebrates its patron saint, Saint Ambrose (Sant’Ambrogio), with a fair called: "O bej O bej". This festival takes place on the streets in the area surrounding the Basilica of Sant'Ambrogio in the centre of Milan. In this day all the area is full of stalls where you can find antique furniture and handicrafts but there are gastronomic stalls too! In fact, you can find cured meats, cheese, sweets and the customary wine of the day, the vin brulé, which is enjoyed with roasted chestnuts - just what you need to warm up on a cold day. The festivity starts two days earlier (Dec 5th) and culminates with the fair on the 7th of December and overlaps the opening of the opera season at the Scala. Quite an active time of the year! While everywhere else in Italy the carnival has just ended, it now arrives in Milan. 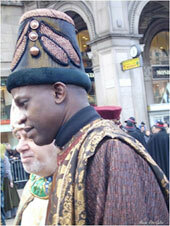 The Meneghino, which is the traditional costume of Milan, consists of the tricorno, a hat with three edges, a wig with a braid, a long jacket in red and brown, green pants to the knees and striped red and white socks. Under the jacket you wear a yellow shirt and a bandana around the neck. The shoes are brown, formed like arches and secured with a clasp. The ensemble is completed with a pink umbrella. This festival takes place on the 6th of January, the day of Epiphany in the Catholic Church, and commemorates the arrival of the three wise men. The day includes a religious procession in which three persons play the part of the wise men and lead the crowd from Piazza Duomo to the Church Sant’Eustorgio at which time the wise men offer some presents to the poor children. The procession concludes when the three wise men hand their crowns to the priest. This day, March 13th, is celebrated as the beginning of a beautiful season but also marks the the day in which Milan's primary religion became Catholic. The legend of its conversion includes Saint Barnaba, who arrived in Milan centuries ago on the 13th of March. Instead of making the requred sacrifice for the pagan gods upon entering the city, he took his cross and drew 13 significant symbols on the ground and when he finished drawing the last one, all the pegan tembles fell to the ground and a plethora of flowers bloomed all at once- turning a frightening day into a powerful city conversion and the first beautiful spring day. After the drama, Saint Barnaba entered the city of Milan and celebrated its first Mass. The following year Saint Barnaba went away from Milan, but he left one of the most famous ritual: the Tredesin the Mars. In fact in that day there is a fair of sweets and flowers between Porta Romana and Porta Vigentina, and a little religious procession which arrives to the church Santa Maria del Paradiso. Although this story is a legend and it has never been historically proven that Saint Barnaba ever even went to Milan, it began a long tradition and the 13 symbols he supposedly marked on the ground were included in the floor design in the church Santa Maria del Paradiso. This fair is in April and it lasts only one day but for this day the treets will become colorful, open air gardens. All the major florists display their incredible flower creations along the Naviglio Grande and the most beautiful and creative composition wins a prize. The Milano Film Festival is the most important exhibition of contemporary and innovative short–films. It is one of the most popular movies events in Italy, Well recognized at a national and internatonal level, the festival features a compitition between a list of movies created in multiple different countries. The Milano Film Festival is unique because unlike other film festivals, they do not follow some of the typical rules followed by the movie market and do not devide the feature films into categories. The festival allows emergening directors to submit their work, provides them with the opportunity to directly contact to the viewing public, and hosts many helpful workshops and meetings that could benefit their career in direct. The Milano Film Festival is organized every year in September and includes other interesting initiatives such as the "Festivalino" (dedicated to young people) and the "Music Film Festival"
SMAU (Salone Macchine Automazione Ufficio) is the Information and Communication Technology International trade fair in Milan which showcases the most original and innovative inventions in technology every year. The event represents the Italian technology progress′ showcase, and for more than 40 years, SMAU has been a real platform for its regular clients, the sector′s experts, industries, backers and firms, meet each other to discuss the concrete use of the newest and the most important technological innovations.